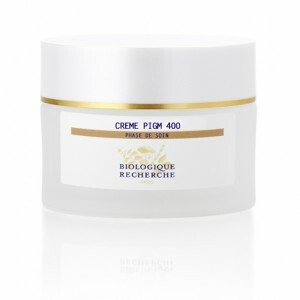 Crème PIGM 400 has been specially formulated to prevent the appearance of pigmentary spots, reduce the intensity of existing brown spots, and brighten the complexion and render it more uniform. This Biologique Recherche treatment contains whitening agents of young cress shoots, plump pulp extract and soybeans that act on the melanogenesis process at all levels, from pigment creation to their surface migration. There are also a number of active substances with antioxidant properties to limit protein and lipid oxidation as well as active ingredients that stimulate lipofuscin breakdown. Pigmented and dull Skin Instants®. Whitening and brightening agents: Young Cress Shoots and Plum Pulp Extract, and Pure Genistein obtained from Soybeans. Protective agents: Wasabi Extract, Vitamin E derivative and Polysaccharide.